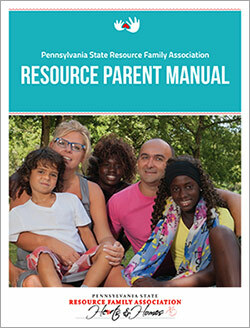 The Pennsylvania State Resource Family Association (PSRFA) with support from the Pennsylvania Department of Public Welfare has prepared this Resource Parent Manual for Pennsylvania’s resource families. This manual supports the Child and Family Service Review, regulated by the Administration for Children and Families and facilitated by the Social Security Act Amendments of 1994, which are designed to support a stronger Federal-State partnership to improve outcomes of service to children and families. We hope this manual is an important source of support and information for resource families as they care for Pennsylvania’s children. Click here to download the Parenting Manual.